Do as Michelle does and shop at farmers' markets! Guest blogger Melissa Contreras here, back again for some more exciting blog-worthy news! All the news that’s fit to blog about Redland farms right here folks! You know me as founder of Urban Oasis Project, and we have been helping Liberty City residents create food gardens for more access to fresh VERY LOCAL food for quite a while now. As a formerly closeted farmer, now aspiring urban micro-farmer, I must say that I love plants, especially food plants, and I feel really great when I am surrounded by fresh-picked local produce! So, last year, I began helping Bee Heaven Farm sell their lovely produce at 2 local markets, Pinecrest and Overtown. The Overtown market was the first all local, producer-run market in Miami in recent history, and seeing its success, many of us started to think that this would be great to have in Liberty City, an urban food desert. It’s easy to find processed foods or fast food there. It’s not so easy to find a mouthwatering, voluptuous heirloom tomato, or any tomato for that matter. This is due to inequalities in our food system, in which not all people have access to real food, produced by farmers and not by factories. We are so pleased to take one more step toward transforming an urban food oasis from an urban food desert! 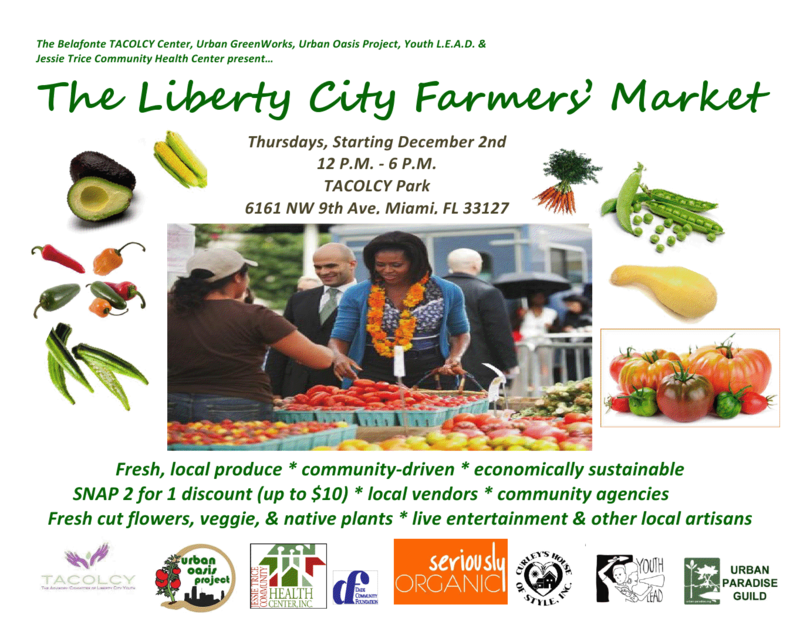 Our new community farmers’ market will debut in Liberty City this Thursday, featuring lots of Redland produce, and a dollar-for-dollar match for food stamps (SNAP) users, up to $10 per user, per market. That’s found money in their pockets for local food! Some Redland growers represented are Bee Heaven Farm, Three Sisters Farm, Teena’s Pride, and the Homestead Pole Bean Co-op, the only farmers’ co-op left in south Dade. Hani’s Mediterranean Organics will have goat cheese and his exotic specialties. Redland Organics member Worden Farm from Punta Gorda will be represented as well, with produce grown by those award-winning farmers, Chris and Eva Worden. The market will also feature seedlings for your garden and native plants, healthy food, kids activities, music, and monthly health screenings, as well as local organizations. C’mon out!